Effectively with calculated technology ! Lift up the entire face * 1 New "Real"
Prepare skin with lotion and so on. Remove the film from the sheet mask. Align the center part of the mask with the lips and place it on the cheek so that both ends of the "A" in the figure are stretched and pulled up. Stretch the ends of the "B" in the figure sufficiently and hold them up while pulling up. Use it so that the raised part of B overlaps with a part of A. Please use for 30 to 40 minutes as it is. You can move freely while using the mask. Put the mask used in close contact with the film in a container. Put the used mask in the refrigerator and cool it. Cut in half to cool your arms and legs. Q. How long should I use it? The recommended time for using X-LIFTING MASK is 30 to 40 minutes. Because this hydrogel mask is a hydrogel that is synthesized into a special fiber, it adheres to the skin without evaporating cosmetic components and moisture. It can be worn for up to 2 hours. Q. Can I reuse masks once used? Sanitary re-use of masks once used is not recommended. 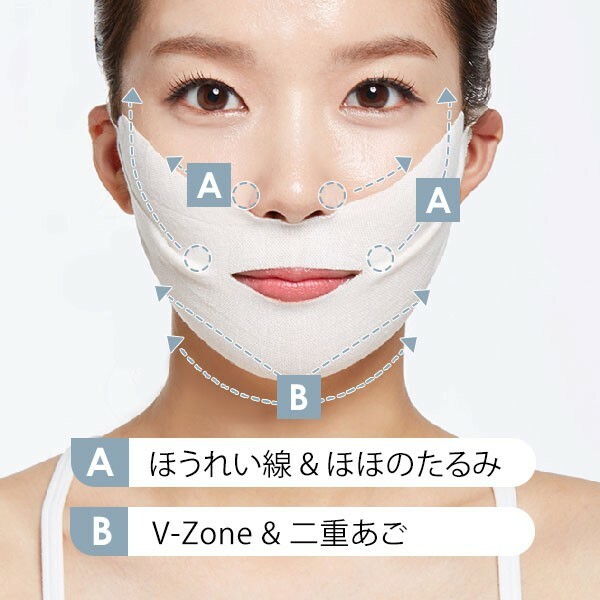 However, since the effect of the X-LIFTING mask is for 2 hours, it can be used on the legs and arms after it has been applied to the face for 30 to 40 minutes. Q. What should I do when the mask on my ear hurts a little? Stretch the fabric before wearing it sideways, and then hang it on your ears. If you still have an earache, insert a notch at the end of the ear. We explain in detail how to cut the part that you put on the back of the product. Please check it. Elasticity of the skin, firmness. You can experience a certain lift-up effect * 1 . The pack is in close contact with the irregularities on the skin. Beauty ingredient tightens the skin and feels firmer up! Beauty ingredients contained plenty of up! Face lines, double chins, horei lines, hoho's tears are close up! Even if the pack continues for a long time, it will continue to support the desired part without stretching or drooping. The X-LIFTING mask stretches freely with high elasticity and returns to its almost unstretched shape with strong restoring force . There is no big difference before and after. In the case of other companies' products, they can only stretch in one direction when stretched, and after stretching they clearly have differences in the fabric . Prevent evaporation of water, sealed a lot of cosmetic ingredients. Hydrogel sheet that does not lose moisture has high adhesion to the skin, and delivers cosmetic ingredients to the skin for a long time compared to general sheet masks. Is a sheet that contains moisture and cosmetic ingredients in a gel that holds moisture . Pruning elasticity is excellent in adhesion and suppresses moisture transpiration for a long time. Volphilin is a cosmetic ingredient developed by Sederma in France. It is a component extracted from the root of a lily family plant called Hanasuge. It strengthens the skin on which the age is concerned and leads it to a resilient, dusty skin. It is a raw material whose stability has been verified by the results of long-term clinical experiments conducted in Europe. Lotus flower extract is an ingredient that has been used for a long time in Ayurvedic in India, and it can be expected to have a tightening effect on the skin surface and an effect of increasing transparency. It activates skin cells and tightens the skin to give it firmness. Collagen extracted from natural aquatic products. Because the structure of the fiber is simple and low molecular, it is well familiar with the skin and penetrates deeply into the stratum corneum, moisturizes the skin, and leads to a healthy skin. Tea (green tea, black tea, rooibos tea, oolong tea) is rich in catechins and polyphenols with high antioxidative action, and it is said that Kakihi also drank green tea daily for beauty. The tea complex extracted from tea tightens the skin and leads to a healthy, youthful skin with a sense of transparency. Coenzyme Q10 is attracting attention as a coenzyme that enhances the moisture retention in skin that is lacking, and it is an essential ingredient for skin with vigorous firmness. By supplementing with coenzyme Q10, which decreases with age, it leads to a skin that has a pin and elasticity. I want to aim at abeautiful woman with a pint in a hurry ! It is a sheet mask that allows you to feel strong lift-ups * 1 by using special fabrics with high elasticity and quickly lifting up parts of your entire face. We combine porphyrin (hydrogenated polyisobutene, horse radish root extract, tocopherol), lotus flower extract, caffeine, coenzyme Q10, marine collagen to support skin firmness, and deliver 2 ※ moisture in the skin of the skin. 1. After opening, take the film. 2. Align the center part of the mask with the lips and stretch the lower end of the mask to the cheek. 3. Fully stretch the top of the mask and put it on your ears. ※ Please use so that the upper part covers a part of the lower part. 4. Please use for 30 to 40 minutes as it is. 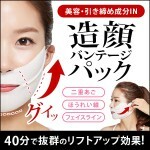 This product can be used for about 2 hours (120 minutes). 5. Please massage your face lightly after use. -The image of the photo and the real thing may differ slightly in color, pattern and so on. 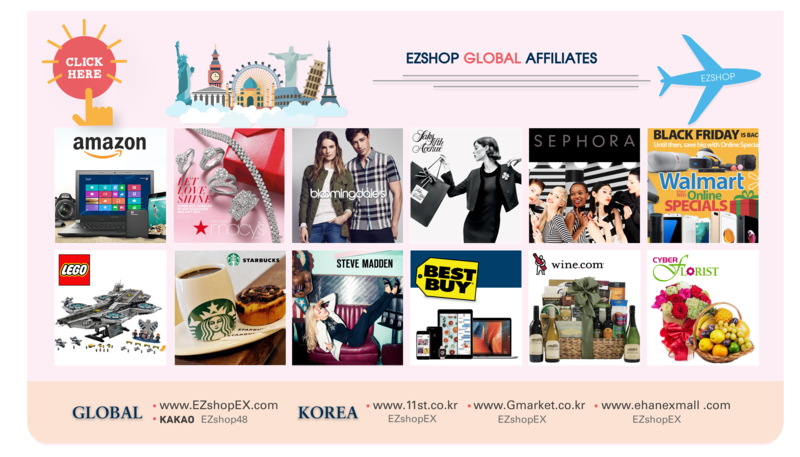 -Depending on the time of arrival, product specifications (design, size, color, materials, notation, etc.) may change. If you do not fit your skin, please discontinue use. ・ It is recommended to discontinue use and consult a dermatologist if any abnormality occurs during or after use. Continued use may result in deterioration. 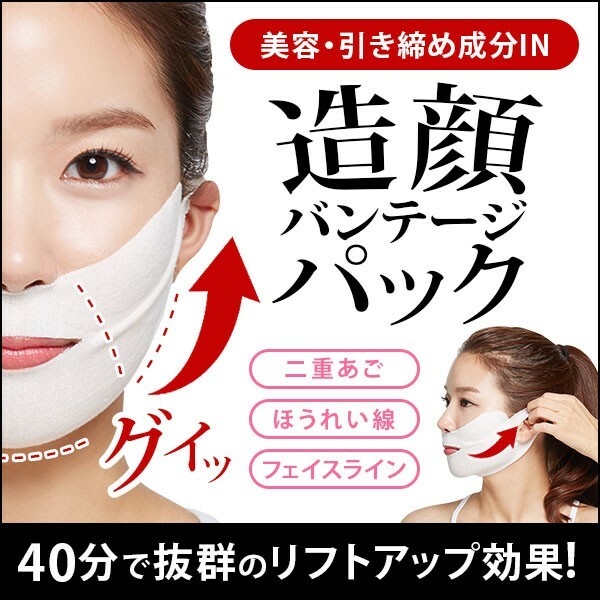 ・ Do not use when there is an abnormality such as wounds, swelling, eczema, etc., or when there is an abnormality on the skin or when it does not fit. ・ If it gets in your eyes, please rinse immediately. ・ Do not store in direct sunlight. -Please contact me within one week after goods arrival about defective goods and missing goods. ・ We can not return or exchange for your convenience.